Pancreatic cancer is a cancer that begins with cancer cells in the tissue of the pancreas that release hormones and the cancer cells grow rapidly and uncontrollably. Someone with pancreatic cancer may lose weight due to not eating because each time they eat, they throw up are nauseous. They may also have an extreme yellow tint to their eyes and skin. They also most likely suffer from back pain and pain in the abdomen near the navel. The abdomen may also be swollen, depending on the degree of the cancer. The possible causes for pancreatic cancer are mostly unknown because by the time someone has it, it has already become to serious in most cases. But despite that pancreatic cancer is mostly unknown it is almost directly linked to obesity, lack of exercise, and in some cases a family history of the disease. First, a routine physical exam is done to rule out other possibilities. If there are suspicions of cancer, a CT scan is done. Once the CT scan is done, if a tumour shows, a biopsy will be done and the tumour will be tested. Unwanted cells are growing rapidly and are spreading without knowing it, until it has invaded to the point of no return. They try to remove the cancer by surgically removing it but otherwise there is no known way to try to defeat pancreatic cancer. Due to difficulty to diagnose pancreatic cancer early, survival rates are slim. Most times once symptoms show it is too late and the cancer has progressed to much and has invaded other parts of the body. #1 Pulcini, Elizabeth. "Pancreatic cancer, endocrine." The Gale Encyclopedia of Medicine. Ed. Jacqueline L.
Longe. 5th ed. Farmington Hills, MI: Gale, 2015. Science in Context. Web. 16 Dec. 2015. Disorders. Ed. Stacey L. Blachford. Detroit: Gale, 2010. Science in Context. Web. 16 Dec. 2015. # 3 Cherath, Lata, and Elizabeth Pulcini. "Pancreatic cancer, exocrine." The Gale Encyclopedia of Medicine. Ed. Jacqueline L. Longe. 5th ed. Farmington Hills, MI: Gale, 2015. Science in Context. Web. 16 Dec. 2015. #4 Traub, Oren. "Hereditary pancreatitis." The Gale Encyclopedia of Genetic Disorders. Ed. Stacey L.
Blachford. Detroit: Gale, 2010. Science in Context. Web. 16 Dec. 2015. "Cancer Symptom Pains - Pancreatic Cancer." YouTube. AwakenedFromSleep, 19 July 2012. Web. 21 Dec. 2015. 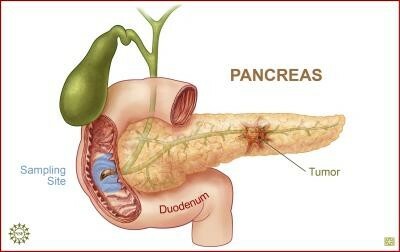 "Pancreatic Cancer News Blog from Medicineworld.org." 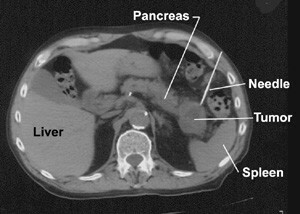 Pancreatic Cancer News Blog from Medicineworld.org. MedicineWorld.org, 15 Mar. 2011. Web. 21 Dec. 2015. "Surgery of the Pancreas." YourSurgery.com. N.p., n.d. Web. 21 Dec. 2015.